Lighting for tanks can seem really complicated at first. You know that your tank needs some light, but which lights work best for your reef tanks? To find the best lighting for reef tanks a full-scale investigation of the lights available was done and the best have been brought together there! Lights that provide great color quality to your coral and tropical fish are sure to be a hit. If you want your tank to look its best, or you are an aquarium enthusiast looking to add to your setup, lights are always a great addition. Sometimes lights will stand out as the best for you, however, there are a ton of cheap imitations that won’t last as long or deliver the quality you’re looking for. The biggest issue with finding good lighting is how many options are available. At first glance, it’s a light overload! However, there is a clear line between high-quality lighting and the low-quality look-a-likes. Don’t let the low-priced competition fool you. With aquarium lighting, you get what you pay for. There are a ton of options, however, finding a good value is all about what features you want to see out of your lights. The ton of saturation in the lighting market can’t mask quality or what is best for you. We’ve gathered everything here to help you decide which options available are best for you and your aquarium! Now, LED lights hit on most of these flawlessly! They deliver very bright, high-quality lighting. Additionally, LEDs are safe to use, generate little to no heat and provide a range of lighting that supports plant growth. LEDs have become the choice for all aquarium lighting and for reef aquariums they are definitely on the top of the list! LED lights are some of the best lighting options for visually impacting your aquarium. They are easily adjusted, can perform in a variety of colors and even have different designs or settings. LED lighting delivers impactful, bright, light quality. Additionally, LED lighting is safe to use. Unlike old-school lighting that produced large amounts of heat, and used a lot of electricity, LEDs use simple components to get the most light out of the least amount of energy. Reef tanks especially are susceptible to temperature changes. LED lighting is a top choice because of this! There is a go-to on lighting requirements for coral, that helps establish your tank and maintain the plant and fish life. For every gallon of water, use three and a half watts of 6700k, or more, lighting for soft coral and for hard corals do the same with four and a half watts of 6700k or more. This 6700K range is the quality of light that is perceived when the sun is at high noon over the equator. In short, you are looking for “Daylight” on your lighting systems. Corals can do well without any actinic light. However, if you have green or blue corals, they can benefit from being highlighted by actinic lighting. This is a visual preference and won’t directly disrupt the environment of your tank. 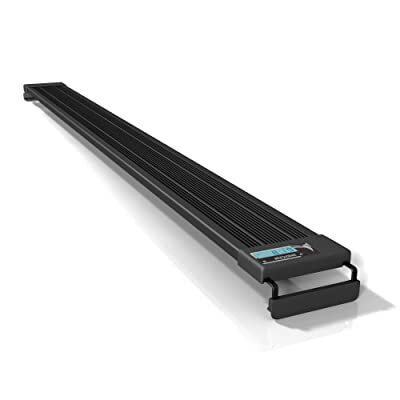 This is a top of the line lighting system and the flexibility to have various sizes is great for beginners or seasoned aquarium enthusiasts. The timer is a plus but the fact that it’s built-in is what really sells this feature. Often timers must be purchased as additional accessories. The same goes for battery-pack backups. That these are already included definitely justifies this price a little bit. Basically, this lighting system stands out because it delivers on all fronts. It sits nearly invisible on the top of the tank, the timer is easy to use, the dimmer is easy to use, and it has everything that experienced enthusiasts search for in a great lighting system. If this system is in your budget, it is worth your time and money. The Aquatic Life LED Aquarium Light Fixture is an investment in your reef tank. The blend of LEDs delivers a great color complimenting lighting for your tank. Although this is the 165 Watt version, there is another 300 Watt option available if you need more. Whichever model you chose, there is a huge difference in lighting from the MarsAqua when compared to most other lighting systems. With impactful brightness, it can cover a large aquarium without issue while many other lighting systems this size struggle. It reaches deep into tanks as well so if your reef gets full lighting exposure. Because this system puts out so much light, its best feature is the built-in dimmer. You can adjust the brightness so your tank is only getting what it needs. You can also use the dimming system to adjust for any plant life you have in your tank. This mixed with the 100,000-hour lifespan ensures that this lighting system will be around for years! A slightly cheaper investment than the first option, the MarsAqua is still an investment that will likely last your tank for quite a while. Don’t waste your money buying cheaper lights every few months as they go out, instead take the plunge and choose a lighting system like the MarsAqua or one which delivers on more of your needs but will last! The Current USA Orbit Marine Aquarium LED Lighting System is difficult to beat. It sets the bar high and doesn’t allow for many competitors to deliver in terms of features or quality. The Current brand is known for aquarium lighting as high-quality and they are supported by a long lifespan. Hands down, the memory setting is the best feature of this lighting system. The entire system is compact, very bright, and all the settings are remotely controllable. However, you can save your preferred settings on dimming or brightness, design, and timer rotation for quick access. When you have found settings you like, program them and refer to them as often as you need to. Many owners of this lighting system report that they end up have a day and night setting that they rotate between. No messing with multiple switches or flipping through ten presets before finding your day or night setting. This makes working with the lighting system easy and manageable. The LEDs in the Current USA Orbit Marine lighting system are super energy efficient, using even less energy than most other LED lighting models. A system that is low voltage will keep your energy bill low, but also prolong the life of your lighting system as a whole. There was a lot of planning in the design of this lighting system. The degree of light dispersion in near perfect for reef tanks. Although the price is a little high, it is worth the investment. Marineland is a top brand throughout aquarium lighting and this model delivers on the high expectations you would have of such a brand. These strip lights aren’t packed with all the features that some others on this list have but make up for it in quality. With a variety of modes that are all catered towards reef aquariums, you know that each setting is going to make your tank look better than your old lighting system. The durability of these light strips is pretty impressive. They are versatile in fitting for the right size by simply adjusting the brackets which means they go from one tank to another as you upgrade. Longevity is not lost on Marineland’s Reef Strip Lights. If you know you’ll be taking care of your reef for years to come, Marineland is a brand to consider. Marineland continues to improve their products, and this model is an upgrade to a previous lighting system. This model supports a ton of preset modes which is a nice bonus but it doesn’t give you a lot of options to adjust them yourself. 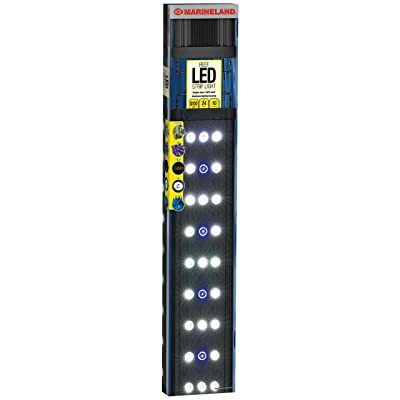 If customization is really important to you, then the Marineland light strips might not be for you. The benefit that is immediately identified with the Current USA Fixture Orbit Marine Pro Lights is that it is easily upgradable. Meaning that when you’re ready to upgrade your tank, it doesn’t mean purchasing another expensive lighting system. LED chips are used to give your reef tank a widely dispersed lighting array. The spectrum delivers more than enough light to help your plants, coral, and fish thrive. Overall a healthy tank is a goal. Hands down the best feature here are how this model uses dome optics. Using dome optics delivers an even spread of the lighting and help the light penetrate into every corner of your tank. 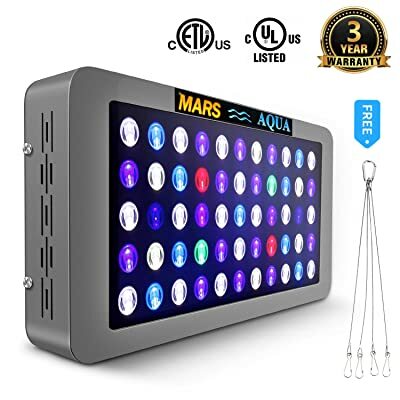 This is great for reef tanks that need light to reach deep into a tank that has reef structure and coral that could block lower lying plants. This is easy to use the system, where switching between modes or effects is simple. However, the programmable option is more of a timer. 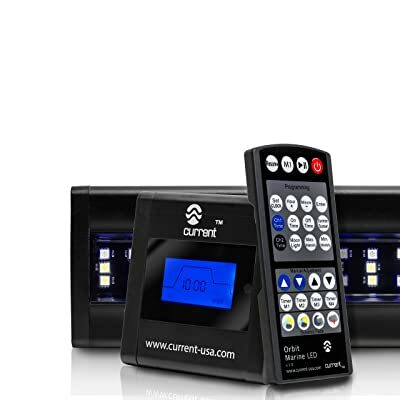 It allows you to set turn on and turn off times, and simulate different times of the day. This is a lot of value shoved into one package. But, keep in mind that all of the effects and programming extras are just that, extras. The MarsAqua Dimmable LED Full Spectrum Lighting is our top pick, delivering great value at a reasonable price without cutting back on features. It has two different options in terms of size and wattage so you have the option of using it for a small or large tank. Overall, the MarsAqua wins out here because it is a simple design that uses a built-in dimmer. 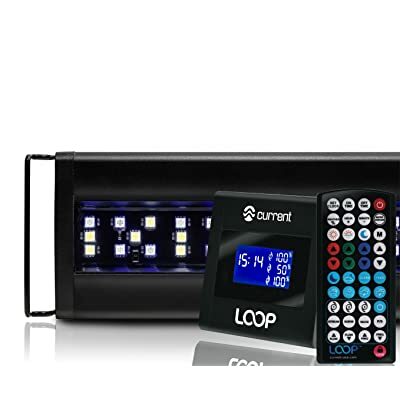 This means you have room to enjoy the lighting system without having an overload of options and programming abilities. If you’re looking for the best lighting for reef tanks, look no further. Of the options on this list you are sure to find one that works best for you, your tank, and your reef!